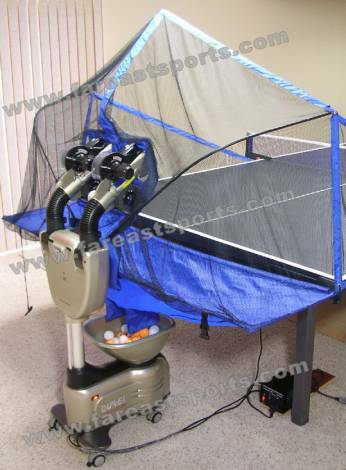 Includes Free Catch Net (like TW2700-06 Robot). Ships internationally! North American Warranty - one year parts and labor. Factory-certified US technicians are available to answer all of your questions and to satisfy any repair needs. This robot comes with North American power supply. International customers will get a power supply compatible with their country's voltage. Special shipping fee for Australia customers of just US$99. Actual cost is around $200-$300 but the rest will be covered by Megaspin. Megaspin extends their warrantee to Australia and parts can be obtained from the US. 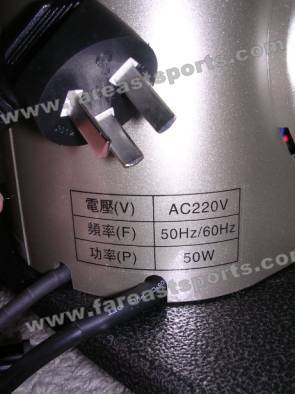 A special power supply suitable for Australia (240Vac 50Hz) can be requested at NO additional charge. You can take advantage of this offer, by clicking on the link above and buy direct via Megaspin. Feel free to confirm these details with Megaspin. The Oukei S-9 (TW-2700-S9) dual head robot was the first of the new dual head designs to be released just prior to the start of 2010. Along with its competitor the Y&T S-27 dual head robot, they both have opened the doors to what most have been waiting for in a robot. 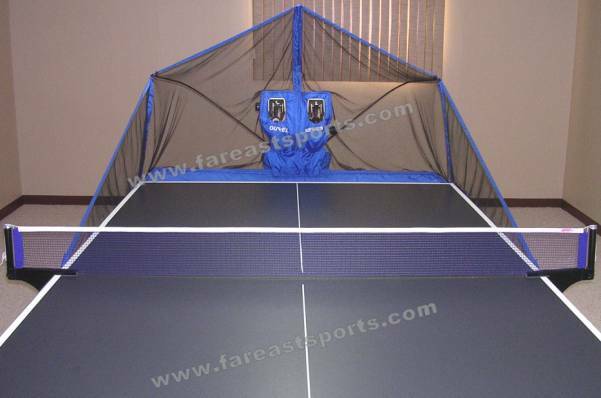 That is the ability to program a sequence with consecutive topspin to backspin balls to programmable landing spots. There have been and are other robots made to do just that, but not at the price range and availability within the mainstream market. Now Oukei brings the S-9 dual head robot to market with a robust assortment of programmability and functions. One of the biggest questions I get lately is, “How does it compare to the Y&T S-27 dual head robot?” To answer that simply, I can say they are both different in their own ways. While Y&T reverted back to some of the 989 era of mechanical controls, Oukei has slightly departed with the standard that their prior TW2700-08 model offered. The biggest change with the S-9 is that the top and bottom throwing wheels on each head are not independently controlled. On the S-9, the bottom and top wheel speed settings are preprogrammed in stages of 1 to 15 for topspin, and 1 to 15 for backspin shots. This means the amount of offset between the upper and lower throwing wheels is fixed and can not be changed from what Oukei has programmed into the stepped settings of 1 thru 15. I did notice that the no-spin ability setting was not making a totally dead spin ball which was more like a very slight topspin ball. Some may feel this is the S-9’s negative aspect if it has any. Those who want to program game like sequences in a way the Y&T S-27 will not allow will see the ability of this Oukei dual robot to be much more in depth and have abilities the Y&T dual head can not accomplish. The Oukei S-9 robot excels in the random and programmable sequence functions in comparison to the Y&T S-27, but the Y&T S-27 excels in the ability to control ball speed and spin with the ability to independently control all 4 throwing wheels separately. This is one of the biggest differences in the 2 robots that may separate your choice of what may be more important to you with your selection of buying either of these two dual head robots. The S-9 control pad as you can see, has buttons all over the place and looks rather complicated. It may be for some users, but for others it maybe just what they are looking for. To make things easier to understand here, let’s separate the control pad into 2 parts. All the buttons on the far right side of the pad except the “Tine/count”, “Regular Mode” and the “On/OFF” buttons are mainly for advanced programming functions. The other main groupings of buttons on the left side of the control pad are the basic setup functions. Because the manual for the Oukei S-9 robot is so easily available in many places on the internet, and because of the length of information for me to go over, I will not get too technical by explaining every function and use of all the buttons. Below is a pretty good scenario of how the robot functions. The first thing you will need to do is setup each head (A and B) for what ever shot type you want to produce in the self programming mode. This simply involves adjusting each head to what ever spin type and landing depths across the table you are going to use. Think of it as tuning in each head before you start hitting balls. 1- With the robot power switch on the base of the robot turned on, hit the “Regular Mode” button to start the setup. Now lets setup head A to produce a backspin (bottom spin/under spin) ball. 2- Push the red “A” button and the readout above it will light up and allow you to set the spin to a backspin shot by pressing the “Bottom Spin” button. Now you will be able to set the speed/velocity or “Revolving Intensity” of the ball in stages of 1 thru 15 by using the up and down arrow button of the “Revolving Intensity buttons. 3- Now let’s simply select how many balls we want to shot out in a sequence. This robot can shoot balls out by duration of minutes or by number of balls. To quick setup the head we will select 10 balls for our quick setup sequence. Push the Time/count button until the “PCS” light comes on. Now use the 2 arrow Up or Down buttons below the readout to select 10. 4- Push the “Ball Frequency” button (balls per minute) to set the release timing between each ball. It is not necessary to change this when you setup head B. You can change this setting while the robot is shooting balls. The range of intervals from slow to fast is more than adequate with this function. 5- Time to start hitting balls and set the landing depth of the balls shot from head A. The robot will only shoot to one of the 1-9 left to right landing spots at this point in “Regular Mode” setup. You can first use landing spot 5 in the middle, then either of the outside landing spots 1, or 9 to fine tune the depth of landing spots to hit the table where you want at every spot from left to right if needed. Push the On/Off button to start and 10 balls will shoot out at a time. 6- As the balls are shooting out you can set the landing dept as is keeps shooting. Press the “Arc adjust” (or vertical head angle) arrow buttons up and down to change the depth of landing spots. 7- Once you are set with how the balls are hitting the table, push the “Adjust/confirm” button to save the shot adjustment for head A. Now follow the same above scenario to set head B to shot a topspin shot. Once you do this, you can make any combination of topspin to backspin shots in a sequence. Just like the Y&T S-27, once you set each head shot type, they can not be changed to other speeds or spin types in sequences. You can change the landing spots during a sequence of thrown balls though. So if you use the above head settings for a sequence, it is not possible to have a ball come from head A, then head B, then have head A change speed, spin, or landing depth. Now, if you want to set up a sequence with specific landing spots and any combinations of using head A and B back and forth, you can actually program each head and left to right landing spots one ball to the next. This is one of a few programmable possibilities where the Y&T S-27 dual head robot is not as in depth as the Oukei S-9. The Y&T robot can not change from a set amount of balls per head before the other head shots a ball. 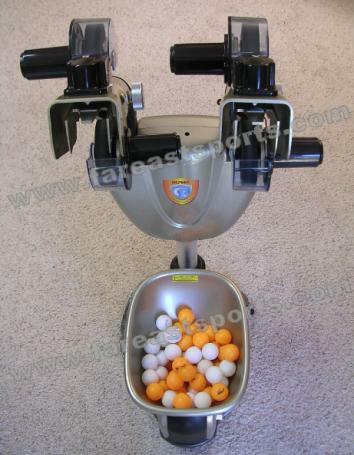 On the Y&T S-27, you select 1 to 9 balls at a time for each head before the other head is used. So if you set head A to shot 1 ball out and head B to shoot 2 balls out to any landing spots left to right, head A will shoot 1 ball, then head B will shoot 2 balls out, then head A will shot out 1 ball out and then back to head B shooting 2 balls and so forth repeating. This is a minor difference between the Oukei and the Y&T dual head robots, but it maybe something that also is important for shot setup of a sequence that you want to train or practice with. 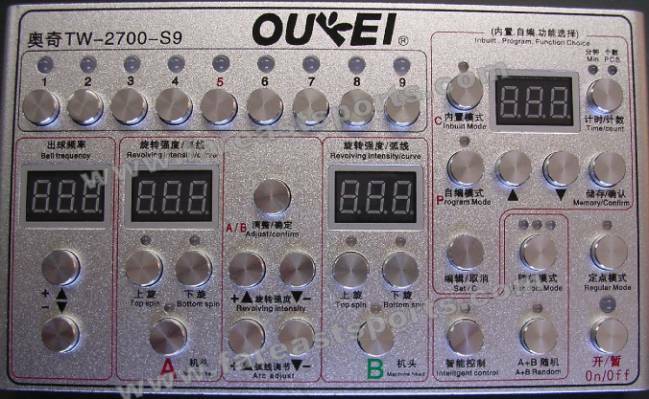 The Oukei S-9 can also make many different random programmable sequences and has several pre-programmed sequences built in. You can also create and save up to 5 of your own custom sequences. For further details and explanations of all the functions, see the manual that is widely available online or request a copy from a dealer. The above picture shows that the control pad has a mount attachment on the back of the robot just like Oukei puts on all their robots. This is a nice feature for when the robot is not in use to keep things tidy and safe. It’s also nice for when you have someone that can act like a coach or trainer to manage and setup the robot while you train. 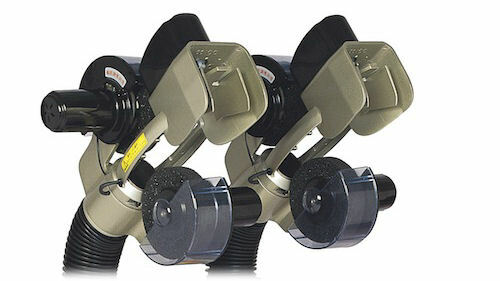 The Oukei S-9 dual head robot uses the same foam type material for the throwing wheels. The use of the tunnel deflection design is still prevalent with the S-9. They have made some refinements here though. The shape of the tunnel deflector was modified by cutting away much of its mass. In the picture below, the smaller tunnel section used on the S-9 makes for much less noise as the ball comes off it. The above picture to the right shows the small gold colored prong that moves up and down on the deflector to adjust the vertical head angle, or in this case the vertical deflector angle. The head on any Oukei robot does not move up or down, nor left to right. Both these movements are made from the tunnel deflector moving inside the head exit area after the wheels shoot out a ball. As I recall using the Oukei single head TW2700-08 robot in my last review, the noise factor from the ball hitting off the deflector was sort of irritating to me. I felt it was something that I did not like with the 08 model robot. Now with possibly different throwing wheel motors and the new tunnel deflector design on the S-9 robot, this was not really an issue at all for me. I think the noise factor is a lot less then with the single head 08 robot, and should not be any concern if this might be a factor in choosing this robot. Oukei has gotten rid of the large plastic housing that incased the head assembly which was used on the TW2700-08 model. I’m not sure why they ever did that in the first place, as some of the prior robots they made before the 08 didn’t seem to have it. In any case I like the much sleeker and open look of the heads without that ugly plastic covering. The rotation of spin angle is the only manual adjustment on the head of the S-9 robot. Just as their prior designs, the heads can not be rotated into a 90 degree pure side spin position. I would think that if Oukei used short stack motors like Y&T did on the heads, it would be possible to allow for full 90 degree head rotation. I am not sure if the tunnel deflector would have any negative effect though. As you can see how the main section holding the tunnel deflector never moves. The throwing wheels and motor section rotates around the main head section. This may be a factor in the way a ball would be guided out of the tunnel if the wheels were fully horizontal in position (90 degrees). By loosening the large locking knob on the back of the heads, you can then set the rotation amount and lock it back into position. The above picture shows the actual amount of rotation you can make right to left. As I previously mentioned, the throwing wheels are the standard foam ones Oukei always uses and they will very slowly wear down at some point. The above picture shows the little foam tool used to set the gap between the bottom and top throwing wheels. If you think the robot is not throwing balls as fast or with as much spin as it did when it was new, it will most likely be because of the wheels needing to be readjusted. Simply take one of the screw drivers that Oukei provides for you (along with a hex key to remove the wheel from the motor shaft), then loosen two screws that hold the motor in alignment. Then you can simply put the little foam gap tool in between the 2 throwing wheels. Then just move the top and bottom wheels together until they slightly grab the foam tool and then lock the wheels in place by tightening the two the screws that hold the motors in alignment. The catch net folds up just like the normal Oukei and Y&T catch nets. The catch net is very different in design from many other catch nets because it isolates the robot body and heads with an extra padded section in the middle of the netting. The heads just barely poke through the two holes in this nicely padded are of the netting. 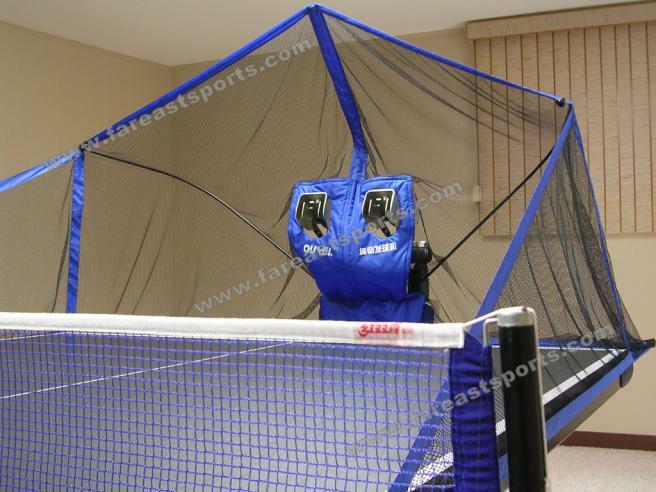 The effect of isolating the robot body and head from the hitting side of the robot helps greatly to keep balls from rebounding out of the net and keep more balls in the netting to recycle back to the robot. This means less balls bouncing in the way of a shot coming out of the robot, or throwing off your concentration because of less balls bouncing around on the robot side of the table. Also, you spend a little less time picking up balls that didn’t stay inside the catch net. Below, the picture shows the unique shape of the Oukei S-9 catch net. The center support is very tall and sticks out a bit higher than on most all other catch nets that I have seen. This also helps keep more balls in the netting. The catch net on the S-9 has plenty of depth from front to back, allowing it great ball recycling ability. Above right shows how the side nets attach to the main net posts. You simply wrap the elastic strap around the bottom of the net post screw and then the Velcro end holds it secure to the end of the side net section. This design is what Oukei normally uses and alleviates the need for 2 more side net clamp pieces. Not a bad idea, but the side nets do not totally close off the side area close to the main net. This allows for a small percentage of balls to not stay on the table. The above left shows the control pad and clamp used to affix the controller to the table. The clamp is strong enough to hold the control pad very securely to the table. The below left picture shows how the catch net simply sets into the holes on top of the robot body between the two heads. 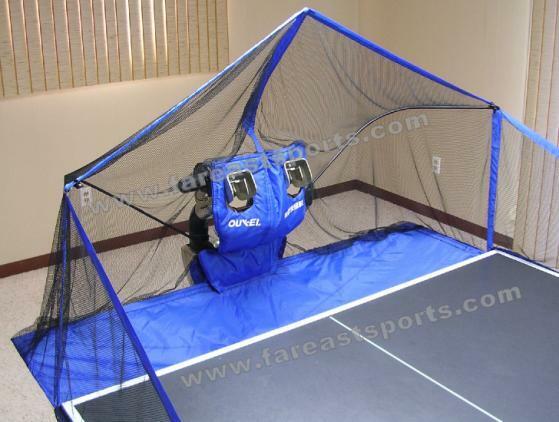 It is very quick and easy to put on or take off the catch net from the robot body. On the back of the robot body below the control pad hanger, (middle picture above) you can see a trap door that exposes the “Y” section of the ball feed tube. The trap door opens (right picture above) and you can free a stuck or jammed ball. I wondered how that are would possibly cause any jam up. After reading the manual and seeing a comment about a broken or damaged ball in this area, that maybe the only way a ball could get stuck in this area I think. Obviously you could get a deformed ball stuck in the bottom of the collection tub or lower unit of the robot, but those areas would be quite easy to remove the jammed ball if it were to happen there. If a damaged ball makes its way up the “Y” section of the ball feed tube, you will have to puke a finger to move it up into either of the head tubes and out from there. But you will not have to push the ball up very far, as you will see shortly from a very unique aspect of this robot. 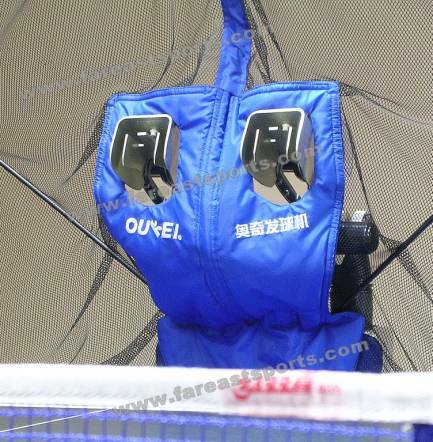 The Oukei S-9 is the first robot I have seen that has retractable head sections. I actually noticed this before I opened up the box when it was delivered to me. At that time, I just had no idea why the box was so much smaller in length than all the other floor standing robots I have received. After thinking about this new design addition, I am thinking Oukei did this mainly for saving on shipping costs. 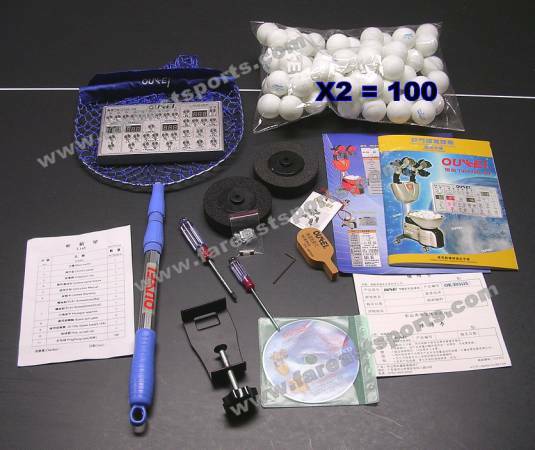 When you ship such a large package such as a table tennis robot, the cost of the shipping goes up more when the cubic size of the box is added to the weight of the box. No matter if this retracting head design was done for shipping cost savings, the added bonus feature of smaller storage area could be very helpful and important to many users. As the catch net is folded up and then held together with the strap and clip on the back side of the robot, it does not close up as narrowly as I wished it would. When folded it up and rolled into a different room, the top of the two main net support stays scraped the door way into my separate storage room. I think it would be nice if Oukei could make the support bar shapes different to allow the folded up catch net to be much narrower than it is now. This may or may not be an issue for some, especially if you remove the catch net from the robot when not in use. The heads are mounted a little wider apart on the robot body in comparison to the Y&T dual head robot though, and the Y&T S-27’s catch net folds up slightly narrower in comparison. The above pictures show how strong and secure the head retraction design is. I do not see any problems with failure or breakage from any weak parts used here. The two ball feed tubes coming out of the robot body are very strong and heavy duty plastic. To fold down the two heads you simply undue the 2 large plastic buckles and then slide the secondary release catch (shown in middle picture) which then allows the heads to be lowered. You can then move the robot into a closet or area that you might not be able to use to store the robot when the net and heads are in their normal position. This is a really great idea that Oukei built into this robot and I wonder if they will incorporate this into their single head robots in the future as well? 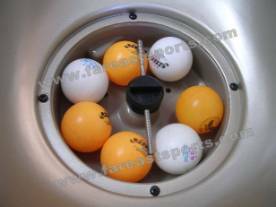 Oukei uses a tightly wound spring for the ball paddle inside the ball collection tub. This is a good design differing from the standard rubber paddle that other companies incorporate into their designs. The base of the robot shows the main power switch lighted up in the ON position. Oukei is now using some much higher grade wheels. The little locking tab on the back 2 wheels also feels much stronger as it takes a little more pressure to lock and unlock them as you push down or lift up to unlock. The left side (cleaning and inspection side) of the base shows the same cork screw design that Oukei normally uses to implement pushing the balls up the feed tube. The above left picture also shows the part of the circuit board (upper right above the balls) where the main fuse it located. Oukei gives you a spare fuse with the robot as well. If you need to clean any dust or debris out of the lower unit, you will have to take out the screws that hold the main plastic covering over the rest of the circuit board and ball path. This process is actually pretty quick to deal with and I highly recommend opening the door to check this area of the robot every few weeks just to make sure there is no potential problem or too much dirt and dust in that area of the robot. This version of the Oukei TW2700-S-9 I am reviewing is the Chinese version. As you can see it only allows for a 220 volt input source. You may need a voltage converter to use this robot in other countries outside China, such as the United States. The robot only draws a max 50 watts, so a 100 watt voltage transformer will do the job quite easily. There are versions of this robot manufactured under the AMDT name which are wired for 110 voltage sources for those in the United States and Canada. In conclusion, this robot was not as complicated as I first had thought it was. Once you figure out the basic setup for setting up both heads and their shots, you can eliminate the confusion of so many buttons on the control pad. Now with that understood, because the Oukei S-9 does have so many different programming and pre-programmed settings and functions to utilize, these advanced programming functions are where the depth of use out shines the Y&T S-27 dual head. You also have the ability to store 5 of your own programmed sequences on the Oukei S-9 and I felt that was incredibly useful. As I mentioned at the start of this review, the one negative aspect of this robot would be the inability to control the four throwing wheels speeds independently. Because the speeds of the wheels are set in preprogrammed stepped amounts, you can not get the wide range of speeds with various spin amounts like you can on the Y&T S-27 dual head robot. So depending on what you are looking for in your training/practicing sessions with a robot, this will be the most important factor in choosing this robot over the Y&T dual head robot. For someone that wants to be able to setup a sequence with each ball coming from either head to any landing spot at random ball to ball, this robot will accomplish that! Over all, I give the Oukei TW-2700-S-9 dual head robot a 9.5 out of 10 rating!